Let’s preface this by saying that no matter what happens in Greece, at WT Wealth Management all of our portfolios have very little to no direct exposure to Greece. 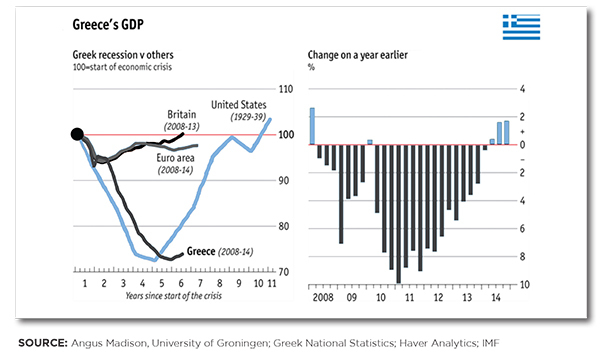 Greece, however, delivers increased volatility, financial uncertainty and general unrest to the global financial markets. With that in mind, let’s take a deeper look at the Greek drama that has been unfolding for years and examine more closely what we are hearing about on the news. Along with, examining the possible outcomes of the Greek debt crisis. Greece has an amazing history, from being the birthplace of democracy, western philosophy, and the Olympics, to the originators of story-book mythology of figures like Zeus and Hercules. In the modern era however, it has a much different and volatile history. Recently Greece has been one of the dominant countries in the daily headlines for worrisome things; like radical shifts in governance and financial disaster that has persisted, as the rest of the world recovers. In order to understand modern Greece we have to look at its modern history. For the last two centuries, Greece has been in relative political turmoil, having gone through multiple monarchies, dictatorships, democracies, and military occupations. They were a battle ground during both world wars and it wasn’t until the 70’s that they finally regained a democratic government after overthrowing a military dictator named Dimitrios Ioannidis. With a population of only 10.8 million people, nearly 40% of which live in the capital of Athens and Thessaloniki, Greece is the 76th most populated country in the world. Greece also ranks as the 43rd largest economy in the world with its two major industries being; tourism and fishing. Since its economy is larger than the rest of the Balkan countries combined, Greece is the economic driver in the Balkan area. It’s a country that has been concurred by everyone that has ever passed by with a ship, the English, the French, the Portuguese and even the Vikings. In order to become part of the Eurozone, a country must first meet stringent financial regulations. These include; national debt to GDP ratio, long term interest rates, inflation rates, and exchange rates. All of these financial metrics must be at acceptable levels in order to adopt the new Eurozone currency. Greece admitted later on, that they had lied about their debt to GDP ratio so that they could meet the guidelines. Even though they lied, they were not kicked out because it was decided it would be too costly and unsettling to the rest of the Eurozone members. Emerging-market economies in particular are expected to have high growth rates which the IMF estimates are two to three times faster than developed-market economies. Corporate revenues have the potential to grow faster when economic growth is higher. However, bottom-line profits depend on how expenses grow. For example; wages in China have continued to rise this year, despite the slowdown in revenue growth. Greek’s national debt rises by 56% to 262 billion Euros, while GDP plunges. The new prime minister also announces that the expected deficit will 12.7% of GDP which is quadruple the EU limit of 3%. The Greek government starts to implement austerity measures in the hope of reducing the deficit, meaning they cut government spending to the public sector and raised tax rates. The Eurozone governments sends $110 billion euro rescue bailout to Greece. Greece’s government announces more austerity measures which leads to mass protests and strikes. In 2011, international lenders say austerity measures are not going far enough. There are more mass protests as the government passes more austerity measures and continues to reduce government spending and raise taxes. Unemployment explodes and GDP continues to fall. EU leaders send another bailout through EFSF (European Financial Stability Facility) of $109 billion euros. Eurozone leaders propose a deal to write off 50% of debt in return for more austerity measures. At the end of 2011 the Greek prime minister resigns. In 2012, amidst violent protests the government makes the deal for 50% debt reduction and $130 billion euro bailout for even more austerity measures. Due to the years of financial mismanagement before the financial crisis and then the recession that was worsened and prolonged by the imposed austerity measures, unemployment hit record highs of 28% overall and 64.9% for those under the age of 24. All of this led to a radical political shift and in January 2015 the, anti-austerity, Syriza coalition wins parliamentary elections for prime minister promising to end the austerity measures imposed while remaining in the Eurozone. Greece has 1.6 billion euro in payments to the IMF (International Monetary Fund) in June 2015. Greece emptied its emergency fund at the IMF to pay its last debt payment on May 12, 2015. Both the Greek government and their international creditors have stated that Greece will not be able to raise the funds to pay its payments in June of 2015 and unless they come to an agreement for another round of bailouts, Greece will default. Creditors have made it very clear that they won’t give another bailout until Greece agrees to more austerity measures in the hope that they will be able to balance their budget. Tsipras ran on a platform of anti-austerity and remaining within the Eurozone, which seems more impossible as time goes on. The main argument against austerity is that the belief that it has actually kept Greece from being able to meet its debt obligations by weakening the economy. 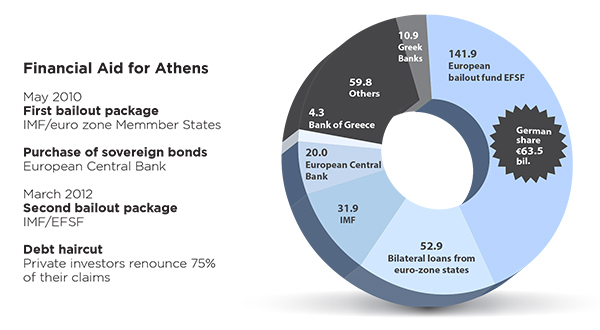 So far, as of early June 2015, Greece and its creditors have failed to reach any kind of agreement on a new bailout plan. They appear to be playing chicken with each other over austerity measures, believing each other is bluffing on their willingness to let the country default. Greece and their creditors come to an agreement for bailout. This may allow Greece’s economy to strengthen enough to where they can start paying their debts off while relieving some of the hardships on the Greek people. Also, Investor confidence in other highly indebted countries will be restored allowing those countries to also continue recovering. The last result is that the international creditors will get paid in the short-run and hopefully be paid in full down the road. The only down side is that this could just be prolonging the eventual default while digging Greece into an even deeper hole. This is undoubtedly still the best option for both sides. Greece defaults on their debt but remains within the Eurozone. This will only happen if Greece doesn’t make a deal with its creditors in time to pay their June 2015 payments. However, if they do make a deal later down the road with their creditors for another bailout they may still be able to remain in the Eurozone. Depending on the fallout of the default, the deal that would result could vary drastically from what has currently been proposed by both sides. Greece defaults and leaves the Eurozone. If Greece were to default there is a good chance that they would be forced to leave the Eurozone in order to protect the other member countries from the financial chaos. If they were forced to leave, Greece would have to re-adopt the Drachma (their old currency). As a result, Greece would be in bankruptcy, the Drachma would depreciate rapidly, making their debt rise and force individuals and companies into bankruptcy. The upside, if any, would be that the government could begin to relieve the austerity measures that were imposed. Hopefully, the cheap Drachma would also boost the tourism industry with less expensive vacations, and possibly allow the resurrection of some industries due to lower labor costs. Even if Greece were to default on their loans Europe has been preparing for such an event for over a year. The EU has a half trillion Euro fund to keep a Greek default from spreading to other countries in the EU. Europe’s economy is growing and early signs point to Europe’s QE measures have been slowly strengthening the European market as a whole. 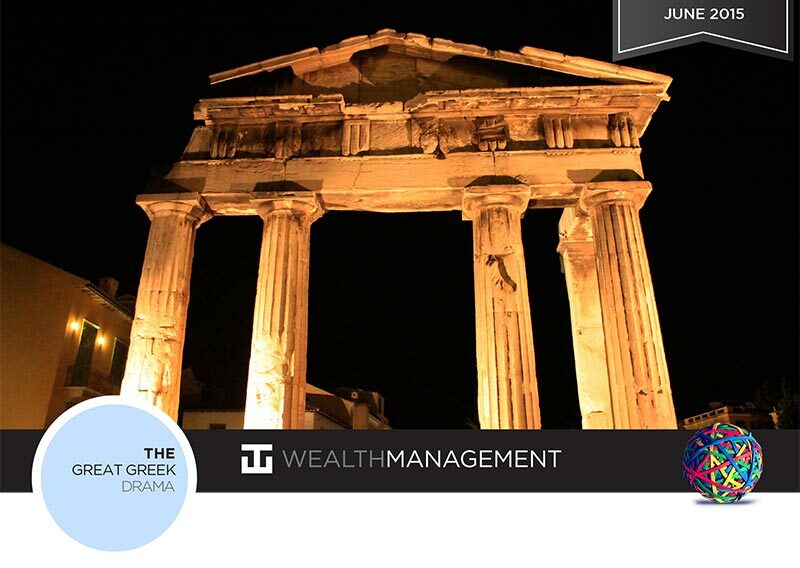 WT Wealth Management has ensured that our clients are not exposed to any Greek drama directly by using ETF’s that have little to no weighting in Greece. We also continue to actively monitor the economic condition of Europe so that we can best position our clients based off of their needs. There is no need to fear the turmoil in Greece, because the rest of Europe has prepared themselves over the last few years and most Eurozone nations are in a position to be able to effectively contain a Greek default. This along with a strong start to the year for Europe should reassure those invested internationally that their investments are well protected from a drawdown but increased volatility will endure throughout the summer. While there is no doubt that the Greek news makes for good fodder on CNBC, The Wall Street Journal and other publications, it will likely have little impact on the global financial markets above and beyond giving sellers a reason to sell and adding some additional volatility to what is otherwise an already volatile market. As stated earlier, WT Wealth Management at the most has fractional exposure to Greek investments. Even in a worst case scenario, our portfolios would not be directly affected by Greece. However, volatility would increase globally in the wake of bad Greek news but things would quickly recover and move to more current news once investors examined and weighed the facts like we have done here. Many experts believe that once we have the news surrounding Greece out of the news Europe can move higher and start to enjoy some of the economic recovery that the United States has enjoyed over the past several years. We agree. In anticipation of the Greek tragedy’s final curtain call, we have increased our European exposure to most of our WT Wealth Management portfolios over the past several months.